Whether it's adapting his dreams (often featuring Snoop Dog), creating stories for unrelated pieces of ephemera, or coming up with some strange little bits of fiction, mini-comics creator and publisher J.T. Yost is someone who's new to me but fits right in with the style, concept, and artwork of many of the folks we feature here on Panel Patter. 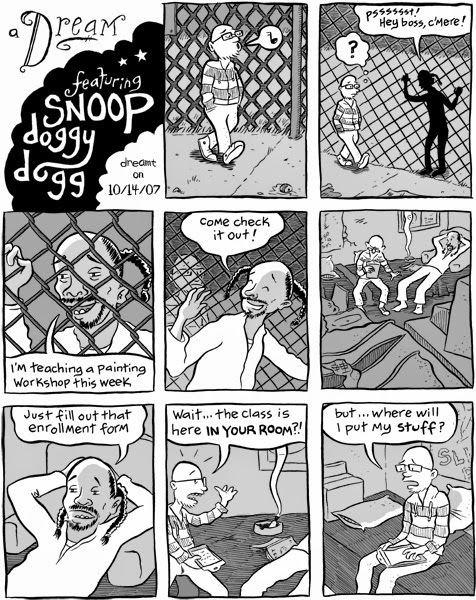 Mr. Yost's possibly best known for the Snoop Dog dream comics, which definitely stand out, given their use of the iconic imagery from Charles Schulz's Peanuts. It's a great, eye-catching visual, even if the dreams themselves don't have much to do with Charlie Brown and company. In two collections, the first which deals exclusively with Snoop Dog Dreams (in which he's everything from a pal on a trampoline to an art teacher), and the second that branches out to other dreams, Yost shows just how ridiculous dream logic can be yet by playing the artwork straight, he also lets us experience the dream as he felt it--with everything real and perfectly normal. There's no exaggerations or bubbles or other things we typically associate with dream drawings. It's an interesting approach, but it works well. With Yost's ability to set the background of the dreams and characters who look like their real-life counterparts, changing only as the dream changes them (like Snoop getting a Richard Pryor moustache for no good reason), it's a lot of fun to get inside the creator's head--literally--and see what's on his mind. In addition to the dream work, Yost also created a series where he imagines stories based on found writings, gathered by himself and others. He uses them as a spring board to tell a story that we eventually come to realize is interlocked in the Losers Weepers series. It's such a great concept--how often do we come across things and wonder where they came from? A note left on a bus seat, a piece of paper with the words "I luv you" on it, the "you took my bike" poster up on the utility pole--we encounter them every day. Yost takes a bunch of these, completely unrelated objects, and turns them into a really depressing narrative with characters so bad he actually has a disclaimer on the work! It's justified, because one of the found objects, which appear to be song lyrics or a poem that would make the brashest, homophobic sailor blush, is brutal to read. In the context of the character Yost uses for this one, though, it fits perfectly. Later, a disturbed child is crafted to incorporate a great essay he found in a trash bin, while a prison letter thickens the plot. All the while, Yost sets the stage by giving us background images that are detailed enough to create a world, something we also see in the dream comics and in his short work. No matter what the comic, Yost has a good sense of timing and what the best image is to draw for the story he wishes to tell. 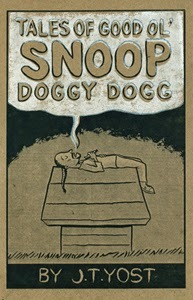 The dream sequences focus on Yost's dream self and Snoop Dog, for example. 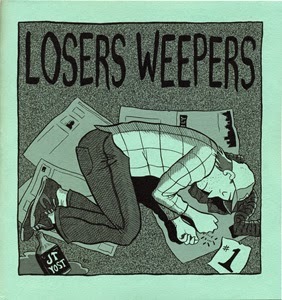 The Losers Weepers settings are commonplace areas--a grocery store, a club, a slightly disheveled home--with the characters moving around in them. I really like that key idea, too--moving. They don't just talk at each other, spouting the lines from the objects. They're sitting at tables, cleaning out cabinets, or acting out in ways certain to get them in trouble. The reader's eye is always on the move, with plenty to focus on. It's good work, and I'm glad to have a chance to read some of it in time to recommend it to those headed to SPX this year. Yost isn't just a creator, however. Like Box Brown, Neil Brideaux, and others, he also publishes some other folks, too. He's published several anthologies, including Cringe, which features Jeffrey Brown, Cara Bean, Box Brown, and many others as well as Digestate that has Sam Henderson, Kevin Canon, L. Nichols, and Josh Bayer, just to name a few. Loud Comix is a series of minis mixing music and comics, something anyone who's a fan of Ken Eppstein should definitely check out. Hopefully, there will be some reviews of these comics coming up in the near future. If you're looking for some innovative comics ideas done well, check out Yost and see what you think. I bet you'll be happy with what you find. I know I was! Can't make SPX? Find J.T. Yost here on the web.